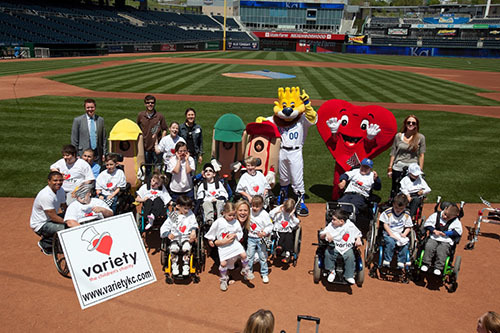 Variety, the Children’s Charity – Tent 8 from Kansas City, is honored to nominate the Kansas City Royals’ Charities for the Corporate Sponsor Award. In a city with thousands of Not-For-Profits, the Royals are the only Major League Baseball team. The number of requests they receive each year is staggering, yet they consider each charity on its own merit. 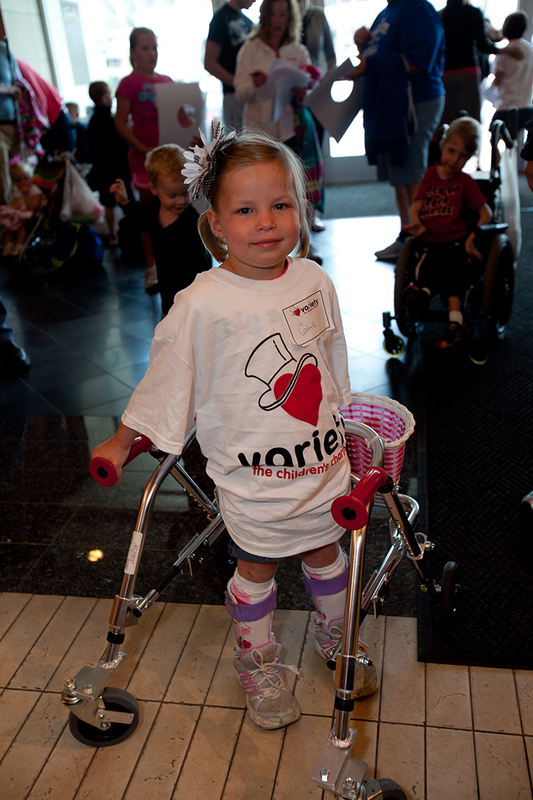 The children and families of Kansas City have received tremendous benefits through the Royal’s support of Variety KC. 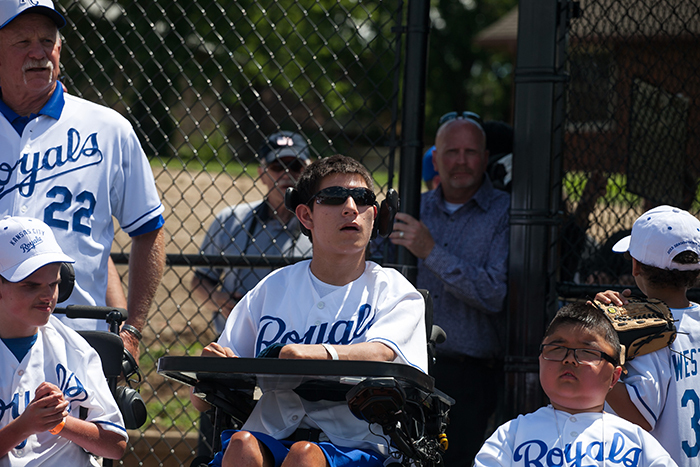 The Royals partnered with Variety for two adaptive ball fields and playgrounds, one on the Missouri side and one on the Kansas side. Through mutual connections, further support was gained. Variety (Deborah Wiebrecht) connected the Cal Ripkin Sr. Foundation with the Royals, and the Royals brought the Major League Baseball Foundation to the table. These partnerships received a great deal of media exposure supporting our efforts. Through this continued relationship, past employees have come on board to assist Variety, the owners of the KC Royals, Dan and Penny Glass, have contributed exclusive of the foundation, and players have participated in Variety events and fundraising. A simple phone call has resulted in generous auction donations raising thousands of dollars, and tickets providing inclusion driven outings for hundreds of Variety Children and families. You might think that in a year that the Royals won the division championship, and played in the World Series, perhaps the organization would be too preoccupied to focus on giving. The opposite was true. Instead, the Royals and Royals Charities used the excitement and large crowds for additional fundraising that will support numerous organizations in our area. 1. Cuddle Bear (hospital gift for current and potential Variety children). 2. All inclusive playground equipment in the Royals pre-game stadium experience area for children. 3. Further support as the inclusive playgrounds as the adaptive ball fields are expanded. Whether supporting Variety, or any of the great charities they back, the Kansas City Royals and Royals Charities have proven they are champions both on and off the field…..and we are their biggest fans! Royals Charities had donated thousands of dollars to Variety’s mission and touched the lives of thousands of Variety kids too! 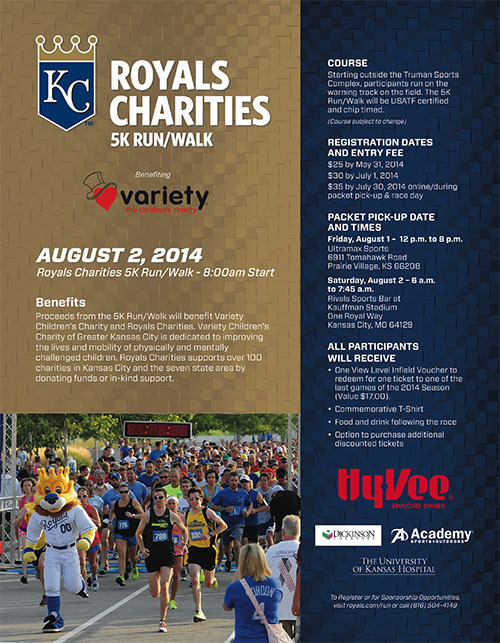 Variety Children’s Charity is this year’s benefactor for the Royals Charities’ 5k, and we’re ecstatic about it. The annual 5k takes place at Kauffman Stadium, going around The K and Arrowhead complexes, and ending around the track down on the baseball field. This year our focus is teamwork, and the fact that success is so much sweeter when you have a group to share it with. 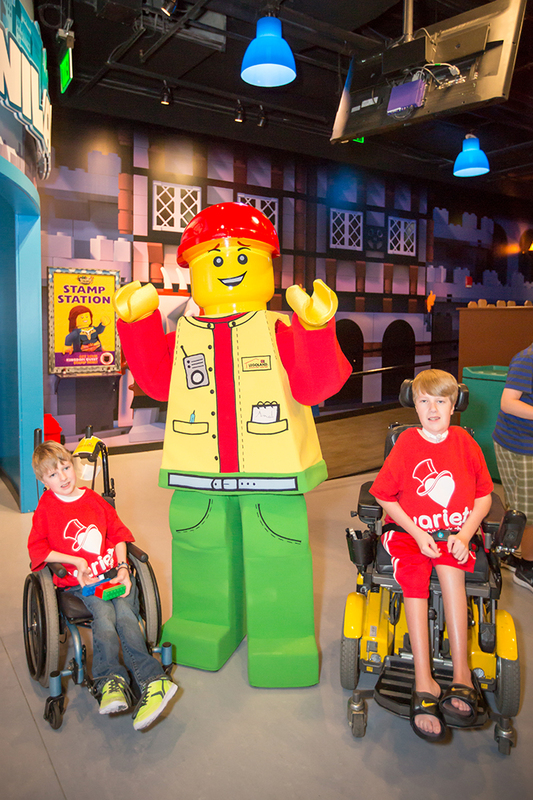 As you know, Variety is a volunteer-driven organization committed to improving the lives of children with special needs. Variety provides these children with developmental disabilities the adaptive equipment and opportunities needed for activity and inclusion within our community. If you are passionate about helping children with special needs and bettering their lives, this is the race for you. So round up a team and head out to Kauffman Stadium on August 2nd to run in the Royals Charities 5k. 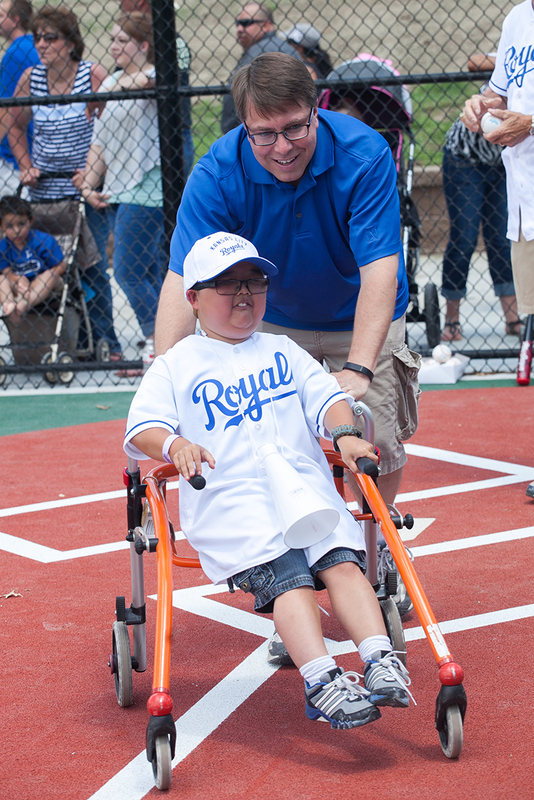 We’re excited about the opportunity to #RunRoyal, for kids who can’t. Jeremy is 20 years old and has Spastic Quadriplegic Cerebral Palsy, Microcephaly and developmental delays. Jeremy is one of our most active Variety volunteers, he is always willing to be a part and help Variety activities be even better. He is always there for the younger variety kids, and continues to be a great support for them. Jeremy’s personality and smile will melt your heart, he sure melts ours. So support Jeremy, just like Jeremy supports the other Variety kids, in the Royals Charities 5k race! Interested in running in Jeremy’s honor? Sign up here and join Team Variety! Be an inspiration, just like these kids are each and every day! #RunRoyal for Kids who can’t, and help us make a difference for them. Catie is a beautiful 7 year old who has Cerebral Palsy and movement disorders. She has decreased muscle tone and is only able to be mobile with a walker and supporting orthotics. Even with Cerebal Palsy, nothing seems to slow Catie down. Catie is an affectionate, loving and one-of-a-kind girl who absolutely loves all of her Variety friends. She always wants to help and include other kids just like her. She has so much heart for a 7 year-old. Sign up today for the Royals Charities 5K race and you can run or walk in honor of this inspiring little girl! Interested in running in Catie’s honor? Today we have two spotlight kids and they are brothers! Noah & Kane are total sports nuts who try and participate in every activity they can! They are both in wheelchairs, but that does not stop them or their family from participating in baseball, soap-box derby racing and soccer. They are setting an example of inclusion by being active in sports and Variety activities. Variety helped Noah and Kane’s family purchase motorized wheelchairs for each of the boys and an adaptive van so their whole family can do things together. These boys are more than just brothers, they are best friends. Sign up today for the Royals Charities 5K race and you can run or walk in honor of this unstoppable duo! Interested in running in Noah & Kane’s honor? Maddox is 11 years old and has Cerebral Palsy, Duchennes Muscular Dystrophy, and Autism. This may cause Maddox to need support from a walker or a wheelchair to be mobile, but he doesn’t let that get in the way of being active. This boy is full of energy and has one sparkling personality. He is quite a social butterfly and quickly becomes everyone’s friend with his magnetic smile. By signing up for the Royals Charities 5K race you can run or walk for Maddox and other kids like him, inspire them to be their best! Interested in running in Maddox’s honor? 5K’s may seem daunting at first, but with the right guidance anyone can #RunRoyal! The distance of a kilometer is only 0.6 miles which makes a 5K only 3.1 miles. And while there may be over 8,500 5Ks held across the country each year, you have the opportunity to be apart of the most unique one held at Kauffman stadium! Do you have what it takes to #RunRoyal? With our tips you definitely can get in shape in time for the Royals Charity 5K on August 2nd. Step 1: Sign Up! – There is no better motivation to start training for a 5K than the commitment to run one. Clear your calendar the morning of August 2nd and sign up now before you read any further! Step 2: Get off the couch….Slowly – You don’t want to get burnt out on running too quickly, especially if you haven’t been working out lately. Start easy with 20-30 minute workouts for the first week. Don’t overexert yourself and make sure to take two rest days during the week to avoid exhaustion and your body rejecting working out. Step 3: Run! – We got this training plan from Active.com that offers a great guideline for how to work out each day. Don’t be afraid to throw some cross training in the mix with biking or swimming laps as well! 3 — 2.5 miles, 2 miles, Race 3.1 miles! 2) Hydrate – There is nothing more important to a runner than staying hydrated. Drink plenty of water before, after and during a run to avoid dehydration and to stay alert and energized even after a long workout. 3) Map My Run iPhone App – This iPhone app has changed the face of running forever. With it you can create your own routes, keep track of how many miles you have run and find popular running trails in your are. And most importantly its free! 5K’s aren’t for everyone, so if training for one does not appeal to you, you can always walk the Royals Charities 5K! Just remember that you are walking and running for kids who can’t!